German Special Customs reveal renderings of yet another upcoming styling package. 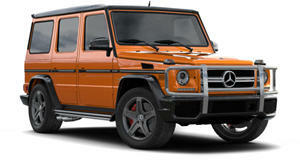 If you are of the opinion that the design of the new Mercedes-Benz G63 AMG needs messing with then German Special Customs provides something interesting to chew over. Dubbed the Goldstorm, the well-proportioned kit offers all-new front and rear-end facelifts. Up front there&apos;s a new bumper, grille, headlights and vented hood. The G-Class also gets new side skirts and fender flares, while at the back there&apos;s a new bumper with more vents, new quad tailpipes and custom taillights. The gold paint job is not a prerequisite for getting the custom body kit, which is a good thing as given the amount of new holes the styling package provides, you&apos;ll end up driving around something that looks like a block of Swiss cheese.